There’s no doubt that TIG welding is some of the most difficult you can do. It requires a lot of dexterity and the finished weld needs to be structurally sound. To accomplish the task, you must have the best TIG welder on the market. That’s why we’ve put together the best TIG welder reviews to help you meet these tight requirements. The equipment you use is only part of a job well done, but it’s a great first start. You still need to have the skills to perform a top-notch weld. Of course, having the best TIG welder makes your job easier. In this article, we’ll go through the top TIG welders currently available. There are many options, each with their own set of features. Make sure you evaluate each one according to your needs to ensure you get the machine that works best for you. If you’re a professional, you need the best TIG welder on the market. This means, opting for as much power as possible. To get the best TIG welder with 250 amps, you’re going to need to make a sizeable investment. With that said, you’ll have a machine that can handle just about anything. Here are our top two choices as the best 250A or better TIG welder. Of course, we give our first place spot to the Everlast PT325EXT. It provides plenty of power plus tons of versatility. To maximize your power, you’ll want a TIG cooler to use in conjunction with this machine. When welding aluminum, you’ll find this welder provides a smooth, stable arc which starts off easily. It also works with single to three-phase power. Surprisingly, it offers a 40% duty cycle at 320A, 60% at 250A and 100% at 200A. It also comes with plenty of adjustments so you can ensure a job well done. There’s no denying this was built with industrial performance in mind. It packs more punch than any other welder in the Everlast line, but the price reflects that. The most useful feature is the Advanced Pulse. This increases the welding penetration while working with aluminum. It also comes with waveform control and AC balance control. Something else that Everlast has going for them is the exceptional warranty period. You get five years parts and labor with this unit. At 60 pounds, it is on the heavy side, but certainly not impossible to tote around if you need to. Overall, it’s a top choice when it comes to professional TIG welder options. Coming in right behind that Everlast machine is another one from the same manufacturer. This reliable and robust 250A welder is the best on the market. It is considerably expensive, but well worth the cost if you weld professionally. This single phase AC/DC has an amperage range of 3A to 310A. That allows it to handle 0.012-inch through 0.5-inch steel or 0.015-inch through 3/8-inch aluminum. The duty cycle on this machine is 40% at 250A and 60% at 200A. It also comes with an AC balance control plus memory features to bring up your most recent settings. There’s even a digital readout for voltage and amperage for greater repeatability and accuracy. This machine is durable and built to be the last one you ever purchase. It will handle anything you offer it and do it with ease. While it does come with the same five-year warranty as the previous Everlast, it does weight significantly more at 85 pounds. You won’t be able to easily take this machine on the go with you. Some people find that the customer service for these units doesn’t compare to that of the Miller or Hobart brands. That’s something to keep in mind, although we doubt you’ll ever need to use them. If you want a good mid-range TIG Welder without spending a lot of cash, this would make a great option. Not only are they the best in this range, but they work perfectly for both the home user or professional. Lincoln is known for their solid reputation. This welder just carries on their legacy and is considerably portable at just 46 pounds. It’s capable of AC or DC welding and can be used for Stick welding as well. The dual voltage capability allows you to operate either on a 120V or 230V outlet. On a standard household outlet, the duty cycle is 25% at 125A and 20% at 75A for stick welding. On a 230V outlet, the duty cycle is 25% at 200A and 20% at 170A for stick welding. You’ll find that the setup of this model is fairly straightforward. Even if you haven’t used one before, you shouldn’t have trouble getting started. With the AC frequency, you’ll have plenty of adjustment to get the tight bead you desire with aluminum welding. Adjust the AC balance with ease while working on less than ideal surfaces. This improves penetration and allows you to complete a variety of jobs. While this option as the best TIG welder is cheaper than the previous models we’ve discussed, it’s still quite expensive. With that in mind, you do get a three-year warranty which proves the durability of this machine. Following up right behind the Lincoln model is this 200A welder from Razorweld. What sets this unit apart from many of the others are the easy to use digital controls. In addition, you can operate it on 115V or 230V with a duty cycle of 35% at 200A. That’s pretty impressive. With the high-frequency ignition, you receive instantaneous Arc and pre-gas ignition simply from pressing the torch switch. This machine leaves no tungsten inclusion and allows the tungsten electrode to remain uncontaminated. One of the special features of this unit includes the auto shut down functionality when large scale fluctuations occur. In addition, it has a unique air channel design which increases heat dissipation to improve reliability and longevity. 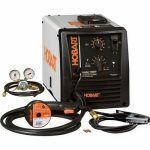 It has AC and DC capability, plus produces high-quality ARC and TIG welds. It does weigh 66 pounds, so it isn’t overly portable. While the price is on the higher end of the spectrum, you should know that this best TIG welder option comes with a three-year warranty. The Everlast takes one of the top spots in the best TIG welder list. It’s offered at a reasonable price, comes with plenty of power for most users and only weighs 60 pounds. It is an AC/DC machine so you can weld aluminum or steel with ease. It handles up to 5/16” steel with a single pass, but up to 5/8” in multiple passes. With aluminum, you can expect to work with 1/4” on a single pass and 1/2” on multiple passes. It also features an IGBT inverter and has high-frequency start capability. This 210EXT also works on both 110V and 240V operation for additional flexibility. It even provides a 60% duty cycle at 240V and 210A. That’s better than anything else in the same price range. If you want a powerful machine at a lower price than the professional units, you won’t find better than this model. For AC welding, you have access to three different types: Sine, Soft Square and Advanced Square. The programmable stick functions include hot start intensity, hot start time plus arc force control. On top of everything, this machine comes backed by a five-year warranty. That’s just the peace of mind you need to ensure the quality is top-notch. As a great choice for the best TIG welder, you might be interested in this combination machine. It features a 200A stick and TIG welder plus a 50A plasma cutter. That gives this unit more value for the money and creates versatility. Other than the exceptional power it offers, it’s also remarkably efficient. At max amperage, you can expect a 60% duty cycle, which is impressive. Just keep in mind that it’s only a DC welder. Even still, it works well for steel; we just don’t recommend it’s usage much on thinner material. All the parts are made in the United States and the company offers seven day a week customer support. This is helpful if you find yourself with a question. Should something go wrong, which we don’t foresee, they even offer a three-year warranty. Finally, the portability is one of the major selling points to this unit. Weighing just 32 pounds, you can take this machine almost anywhere with you. It’s portable, reliable and well-priced; an all-around great device. The reviews don’t get much better on a TIG welder than they do with this model. If you want power, this is the best TIG welder for the price. With the ability to work within a 100-200V range while pumping out 200A, this is one of the most flexible machines currently on the market. It also features a 60% duty cycle, superior arc stability and AC/DC capability. You’ll be able to use this with thin or thick materials. This welder comes with advanced inverter technology that offers Pulse Width Modulation for a perfect weld. It also comes with a foot pedal to provide accurate operation and superior control. It is on the heavier side though at 69 pounds, you might not want to carry it around with you. It even comes with a 30-day money-back guarantee and a three-year warranty. That provides you a little extra time to make sure you like the welder and isn’t an option with many other units. With that said, you might find that some of the accessories don’t live up to your standards. You may notice it especially with the regulator. It doesn’t come calibrated to most people’s standards. There’s quite a discrepancy between how much gas you have and what is actual. Of course, for the price, it’s hard to complain. If you want the best TIG welder, but you don’t want to invest too much money, you might do better with a lower amperage model. Typically, these work well on thinner materials such as aluminum, so you won’t find the same versatility. If you don’t work with heavier metals, then these are sufficient. They are geared mainly toward the home user and not for professional usage. This entry level welder from Hobart is impressive and the price isn’t too high either. It features both AC and DC functionality plus it operates at 230V. The controls can’t be any simpler. There’s just one dial that you adjust for your amperage. Choose from 10 and 165 amps plus use the single switch to go back and forth between the AC and DC operation. The included foot pedal offers easy control while welding. There’s also a high frequency start to allow non-contact arc start. Some of the features further extend this machine’s longevity, which makes it a great value. The fan on this welder reduces the potential debris which gets pulled in during cooling. In addition, there’s an automatic high-temperature shutdown which further protects you. The duty cycle isn’t overly impressive, but we didn’t expect it to be on this beginner unit. At 150A it has a duty cycle of 20%, but that jumps to 100% at 50A. If you compare it to an entry-level Miller machine, you see this one lacks. Still, it’s a solid welder and quite durable. It works with 22-gauge to 3/16” materials; either aluminum or steel. Of course, it also comes with Hobart’s long five-year warranty which is another plus. On the downside, it does weigh 50 pounds. While this doesn’t seem overly heavy, it is for an entry-level machine. With that said, when you are just learning, flexibility is more important than portability. Of all the TIG welders in this category, the Forney 322 shines above the rest. It has one of the best prices, capability and quality in this power range. This multi-process machine handles TIG (with separate parts), Stick plus MIG welding. That’s why it’s a great all-around machine for any home welder. To use the 322 for your TIG welding, you will need to purchase a foot pedal and TIG torch separately. This adds some additional cost to your upfront expenses. Even still, you’re getting a great deal when compared to many of the other units. Just keep in mind that the 322 isn’t geared toward heavy fabrication work. 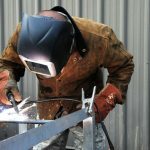 As a MIG welder, it handles ¼” of material, but it requires a decent amount of preparation to ensure the weld is strong. You have to make sure there’s no grease or dirt on any of your material and then hit it with a grinder or wire brush first. In addition, you’ll want to ensure a stable ground connection. Anything you weld below ¼” should be a piece of cake. That’s why this is the best TIG welder for smaller, household projects. It’s also easy to use and simple to control. Just select what type of welding you wish to do, make your adjustments and get started. Not only does this unit come with a five-year warranty, but it only weighs 38 pounds. That’s lighter than most of the machines we’ve reviewed for you. It also features a duty cycle of 60% at 60A and won’t require a special outlet to run. As a slight upgrade from the last model, we have the 190-amp Forney. It still features a good price; just with a little extra power. It’s built of high-quality materials for a long life and doesn’t cave under pressure. This allows you to work on your boats, automotive projects, farm equipment and more. We love that it can be used for MIG or TIG welding because it eliminates the need for purchasing two machines. It also operates on both 120V and 220V for complete customization. Both welding guns are included as is the adaptor you need. At just over 50 pounds, the machine isn’t too bulky either. You could carry it around with you if you desired. With that said, there are a couple of points about this machine that don’t please us. First, the wire feed speed knob doesn’t seem to be made of the same quality as the machine. It feels flimsy and uncertain. You also aren’t going to be able to weld any thick materials, but that’s too be expected with this lower-priced model. Still, Forney stands by all their products with a five-year warranty. We’ve also heard great things about their customer support. Overall, you can’t go wrong with this purchase if you need to work around your home. More of the TIG welders on the market are being shipped from overseas. While that doesn’t mean they are all junk, a good portion of them don’t live up to our standards of quality workmanship. That’s why you want to evaluate each TIG welder by these criteria to determine what’s best for you. The most important part of the best TIG welder is the amperage range. The larger the range, the more versatile it is. For example, a TIG welder with a 5-230 A output range allows you to weld anything. The best TIG welder also features a good performance even when at a lower amperage. That’s what makes it flexible and offers you the most control over the arc. Low amperages cause the arc to get bouncy at times. This tempts you to increase your amperage to steady it. If you plan to work with thin metal, the higher amperages might burn through it. That’s why you need as much flexibility with the range as possible. For maximum flexibility, you want a machine that has both the AC and DC output. For harder materials such as stainless steel, you want DC. On the other hand, AC capability is best for self-oxidizing metals such as aluminum or magnesium. The AC gives the welder the opportunity to clean away oxidization at the same time the weld is performed. You’ll also want a balance control for the AC to shorten or lengthen the welding and cleaning cycles. Some of the best TIG welders come with automatic balance control. This adjusts alongside the output amperage. If you have room in your budget to purchase the best TIG welder with automatic balance control, we highly recommend it. These improve the appearance and quality of your weld overall. It’s critical that you control the heat on your TIG welder. When you work with thin and delicate materials, you’ll warp the metal when you apply too much heat. Some welders choose to use pulse welding as a way to minimize the warpage. This alternates between the low and high peak current during operation. Pulse welding also stabilizes the arc while creating a reduction in heat on the material. Again, if you have room in your budget, this is an excellent feature to invest in. The duty cycle is the measurement given to tell users how long your machine runs at a given output within ten minutes. For example, if you have a 200A welder featuring a 40% duty cycle, that means your device runs four minutes at 200A before you need to let it cool. The lower priced TIG welders have duty cycles around 20% or less. They also come with smaller power supplies. The best TIG welder comes with a heavy-duty cycle near 60%, but it’s going to cost you a good chunk of change. The larger the power supply, the more power it has. That increases the price substantially with every bit of power it receives. If you can afford to buy the best TIG welder with plenty of power, then do that. Otherwise, you might be disappointed with the results. We’ve already established that TIG welding requires skill. That doesn’t mean you should have a difficult time figuring out the machine. You want the best TIG welder to be user-friendly and easy to understand. The controls should be laid out in a manner that you understand. Having accessories included that make the task easier are also helpful. For example, a foot pedal gives you control over the amperage and allows you to focus on your job. We don’t recommend skimping on a foot pedal. It’s like driving a car without an accelerator. If the unit you plan to purchase doesn’t come with one, make the investment to add it on. Avoid some of these common mistakes when you purchase the best TIG welder. Check the input voltage – Make sure you understand what type of power you need. Some of the welders operate on both 110 and 220v, while others only use one. Understand the functions – If you don’t plan on using some of the functions, then you’re spending money for nothing. Evaluate all the features and make sure you’ll use them. Determine if you need a cooling unit – Larger TIG welders require separate equipment for cooling if you want to achieve maximum power. This is going to add more money to your cost, so you want to know this upfront. Understand the power demands – If you might need more power in the near future, consider this before making a purchase. It’s best to spend more now and have the machine you’ll need than to turn around in a few years and make another purchase. Don’t overbuy – Of course, you want to think ahead, but don’t buy more than you’ll need. If you’re just a hobbyist, then pick a unit that has enough power and a low duty cycle to save some money. TIG welding is dangerous because of the exposure to gases and heat arcs. That’s why you need to ensure you follow all the safety protocols necessary before you begin welding. Here are some of our best safety tips for TIG welding. Wear safety gear. Consider the benefits of using gloves, helmets, goggles, jackets, long sleeves, aprons, close-toed shoes and pants. Always work in a ventilated area. The fresh air reduces the toxic fumes in your area. Ground all your welding equipment properly. If not, you face an electric shock risk. Maintain a dry work area. Any moisture increases the chance of electric shock. Prior to welding, clean off the impurities on the surface. Contaminants and pollutants affect the weld quality. Don’t weld with the wrong current. The electrode and metal you use determine what current you need. It’s wise to cut off some scrap metal and test the settings there first. If you need the best TIG welder, you’ll want to first evaluate your needs. Then, take a look through our top ten best TIG welder reviews to find the machine that fits your tasks. You can find budget-friendly options as well as some top of the line professional units. Once you’ve invested in your new machine, it’s time to get to work.